NASA is using Green Hills Software's Platform for Avionics in safety-critical electronics—including the command computer—aboard NASA’s Orion crew exploration vehicle. 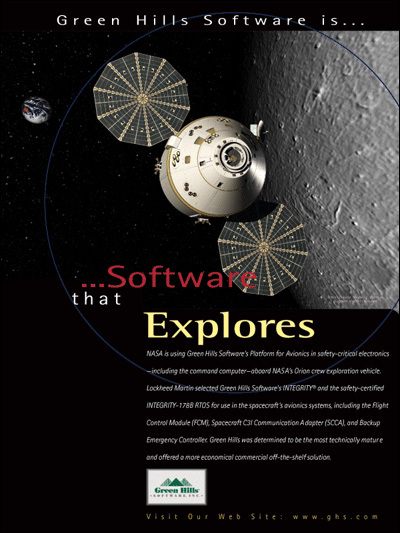 Lockheed Martin selected Green Hills Software’s INTEGRITY® and the safety-certified INTEGRITY-178B RTOS for use in the spacecraft’s avionics systems, including the Flight Control Module (FCM), Spacecraft C3I Communication Adapter (SCCA), and Backup Emergency Controller. Green Hills was determined to be the most technically mature and offered a more economical commercial off-the-shelf solution.